If you love your vibrant viburnum hedge, you’ll want to keep viburnum leaf beetles away from your home. The larva of these leaf beetles can skeletonize viburnum leaves quickly and efficiently. However, getting rid of viburnum leaf beetles is far from easy. 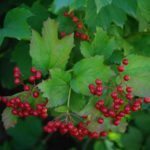 How to treat for viburnum leaf beetles? Read on for information about the viburnum leaf beetle lifecycle and viburnum leaf beetle control. What are Viburnum Leaf Beetles? If you’ve never heard of this insect pest, you might ask: “What are viburnum leaf beetles?” Viburnum leaf beetles are small insects that feed on viburnum leaves. The beetles arrived fairly recently on the continent. They were first found in North America in 1947 in Canada, and were not seen in the United States until 1996. Today, the pest is found in many eastern states. An adult viburnum leaf beetle is between 4.5 and 6.5 mm long. The body is gold-gray, but the head, wing cover and shoulders are brown. Larvae are yellow or green and twice as long as the adults. Both adults and larvae feed only on leaves of viburnum species. Larvae skeletonize the foliage, beginning on low branches. Only the rib and the veins remain when they are done. Adults also feed on the foliage. They chew circular holes into leaves. One of the reasons that it is hard to control these leaf beetles involves the viburnum leaf beetle lifecycle. All summer long, females chew holes in the branches of the shrubs to lay eggs. About five eggs are inserted into each hole. The female caps off the hole with excrement and chewed bark. Each female lays up to 500 eggs. The next step in the viburnum leaf beetle lifecycle involves the eggs hatching out. This occurs the following spring. The larvae munch away on the foliage until June, when they crawl into the soil and pupate. The adults emerge in July and lay eggs, completing the viburnum leaf beetle lifecycle. If you want to learn about viburnum leaf beetle control, you’ll need to plan separate attacks for eggs. Your first step is to look very carefully at the young twigs of the viburnum in early spring. Try to spot eggs sites that swell and pop their covers as the weather warms. Prune out and burn all infected twigs that you find. If, even after pruning out the egg sites, you still have larvae, apply registered insecticides in the spring when larvae are small. It’s easier to kill larvae, which cannot fly away, than adults that can. Another good way to go about getting rid of viburnum leaf beetles is to plant less susceptible viburnums. Many are available in commerce.